It is best to allow your calf sleeves to air dry out of direct sunlight to ensure that they do not fade and the compression material does not break down. 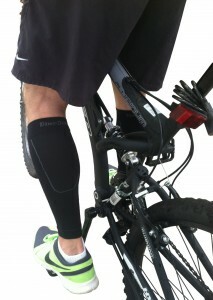 DinoDerm, the best calf sleeves, are designed and constructed with top quality fabrics. our unique blend of 80% nylon and 20% spandex provides users with a durable, breathable, washable, and stylish garment to wear during exercise or recovery. With the graduated compression rating of 10–20mmHg and our seamless, 360° circular weaving technology, each sleeve is guaranteed to be comfortable and easy to put on and remove. The DinoDerm graduated compression sleeve is designed for calves ranging from 12-17.5 inches as measured around the largest part of your calf. In addition, they are slightly less than 11 inches long, which makes them ideal for people of average height. Each sleeve should cover your entire calf muscle, and the extent to which you adjust it closer or farther away from your ankle is merely a personal preference, and has no bearing on its functionality. 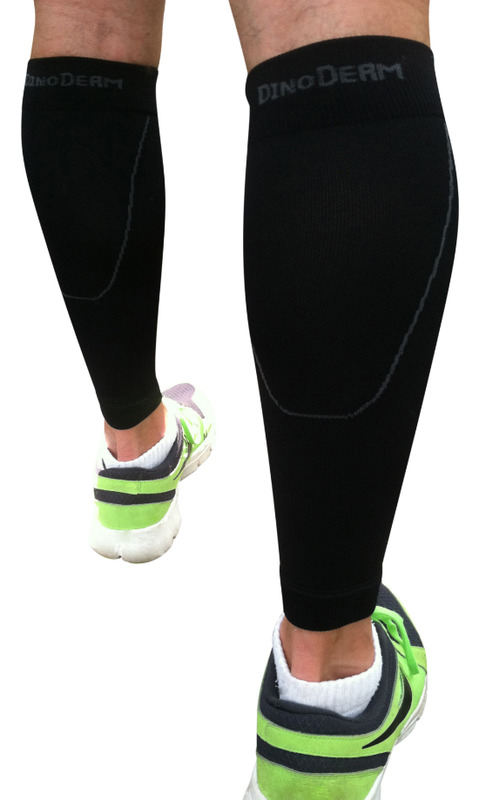 If you are new to calf compression sleeves, then you may not be aware of the reasons why so many athletes choose to wear compression garments in the first place. While compression sportswear is sometimes worn simply because it is popular, there is a great deal of scientific data that supports its use as a way to enhance performance and speed recovery time from injury. The main reason we launched DinoDerm calf compression sleeves is because, as a couple who runs, we began to experience common running injuries like calf strain, shin splints, and plantar fasciitis…fortunately, not all at the same time. Still, after dealing with a persistent case of shin splints and the lengthy ice/ibuprofen/rest recovery regimen, we turned to sports medicine to see if there is any way to speed up the time it took to recover. That is when we learned about graduated compression calf sleeves. After trying out all the big names on the market (some were good, most were garbage), we concluded that we could make a better calf sleeve that would be more effective, and less expensive than the ones being sold in sporting-goods stores. So we committed a large chunk of our life savings to developing, testing, designing, and manufacturing DinoDerm calf compression sleeves. Now, over a year later, and with hundreds of satisfied customers, we could not be happier knowing that we are providing a superior product to people who are either dealing with a running injury, or trying to prevent one. But not all of our calf compression sleeve customers are athletes. In fact, there are a number of healthcare workers, shift workers, teachers, and others whose jobs require them to stand and walk for hours every day. You can read more about the science behind our compression sleeves in the compression sleeve articles section. Most importantly, we want all of our customers to know that, as a small family business, DinoDerm is on your side and committed to helping you live the healthiest life possible. We hope that when you buy our calf compression sleeves, they will play a small role in improving your life and activity levels.